Bao Bolon is located on the North Bank of The Gambia River opposite Kiang West National Park. It consists of six major bolons between Salikeni and Katchang. Together these bolons form a vast wetland complex of international importance. Bao Bolon does not have the characteristics of a river any more. It is a valley which stretches over a length of more than 140km from the border south of Ferlo towards the river Gambia. The valley crosses the Senegalese territory at Marlene and penetrates the Gambian territory through Illiassa. The tidal flats have been the subject of low cost communal dyking schemes for fresh water retention and rice production. The area has been designated as a Ramsar (The International Convention on Wetlands) site. With funding from the Ramsar Bureau, a detailed environmental, ecological and socio-economic survey of the reserve has just been completed. This survey provides a sound management plan for the area in order to optimise the amount and quality of wetland habitat available to waterbirds and other wetland dependent species. The proposed area is approximately 22,000 ha. The significance of Bao Bolon lies in the fact that three distinct ecosystems - mangrove forest, salt marsh and savannah woodland - all occur in very close proximity at several locations. Bao Bolon’s mangrove ecosystem provides an important fish breeding ground and its tributaries are an important source of fish. Local communities also obtain fencing and roofing materials from the area. Bao Bolon contains four main eco-system - estuary, woodland-savannah, salt marsh and mangrove forests. The Bao Bolon is a braided river system which extends north into Senegal, and in The Gambia forms a network of waterways and marshes interspersed with dry woodland savannah on higher ground. The flow of the Bao Bolon is now only concentrated in the rainy season and the resulting saline intrusion allows the mangrove to extend far up the bolons. At this point in the River Gambia, mangrove forests reach heights of up to 12m due to the lower osmotic pressure exherted by the lower salinity levels that occur towards the river mouth at Banjul. To the north of the reserve, the marshes are dominated by large stands of the reed Phragmites Karka . The best way to explore the resereve is from the River Gambia by boat, and to wind slowly up the bolons through the mangrove until the surrounding land rises and the mangrove gives way to a mosaic of marsh, salt flats and ry woodland. The drier areas can then be accessed by foot. 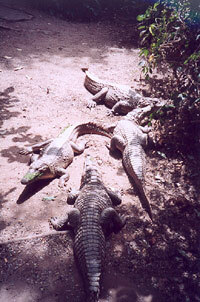 On the journey up through the bolons, you may see crocodile basking on the muddy banks or the slide marks from where they re-enter the water. African Clawless Otters occur throughout the reserve and can prove quite inquisitive when encountered. Further upstream, common warthog, hyena and jackal my be seen in the drier areas. Access by road is available from Konue Kunda Niji where a laterite track leads south along the base of the escarpment to the west of the bolon. From the escarpment edge excellent views are be had and it is a good location from which to scan for wildlife. Other access points by road include Katchang to the east, Njaba Kunda to the north and Salikene to the west. Wetlands have a unique and valuable role in supporting food chains, providing habitat for fish and wildlife, and maintaining natural hydrological regimes. The value of wetlands in this regard is seldom realised until they are lost through drainage or other man induced alterations of their hydrology. The associated flora and fauna of wetlands is extremely diverse. The River Gambia which forms the spine of the country is fringed by a mosaic of wetlands with varying ecologies depending on their proximity to a marine influence.Mangrove swamps dominate in the lower reaches of the river, with gallery forest and raffia/reed swamps above the limit of saline intrusion. A vast portion of Gambian marine and freshwater fish species are dependent on these ecosystems for successful reproduction and nursery conditions. However, the complexities of the various species life histories is far from being fully understood. They also provide essential conditions for a wide diversity of indigenous and migratory bird species. Being habitats with very special characteristics, and besides their high biological productivity, wetlands are also very sensitive to change within their whole catchment basin. Their resources have been exploited continuously since antiquity (for fishing, cultivation, building materials etc). But they are related to a more precious resource - water, which especially in Africa and particularly in the Sahel, is becoming more and more scarce. As human population - and therefore demand - increases, supply becomes reduced by inappropriate management practices and climate change. In recent years increased awareness of the need to conserve coastal and inland wetlands throughout the world has led to the cataloguing of major wetland sites, to the designation of many as reserves, and to the funding of research into their ecology. The value of a wetland is dependent on the maintenance of its hydrological regime. Bao Bolon provides a refuge for a number of The Gambia’s rarer birds. Within the mangrove forest, Pels fishing owl can occasionally be encountered roosting silently while brown necked parrots chatter noisily through the canopy. The African Fish Eagle and Osprey both fish in the River Gambia and the network of bolons. The cry of the former is characteristic of the area. Finfoots have been recorded quite frequently and the white backed night heron is resident if somewhat elusive. The tidally flooded marshes and pans are frequented by a variety of herons, ibis, waders and waterfowls, with numbers seasonally augmented by European and African migrants. The reed-beds on the upper bolon are used for roosting by mixed flocks of passerine birds, as well as providing feeding and breeding habitat for various waterbirds. Wetlands also form the major habitat for a number of our rarer mammals, including hippopotamus, West African manatee, African clawless otter and sitatunga as well as reptiles such as the Nile and Dwarf Crocodiles, various chelonians and snakes.